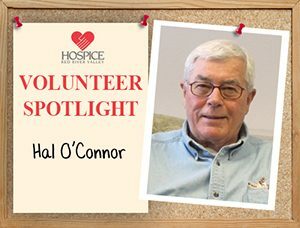 I need to be busy, and volunteering at hospice is a rewarding experience that contributes to the good of the community. Where is the most exotic place you have visited? When and why did you go there? The most exotic place I’ve been to is Midway Island in the North Pacific. The island is run by the U.S. Navy, and it is home to hundreds of “Gooney Birds.” We were flying an old Air Force plane from Guam to a storage yard in Tucson, Ariz. I was there twice, in 1959 and 1966. My perfect day includes volunteering at the Hospice office in a variety of capacities. I help by sending physician orders to doctors for signatures, scan orders into the computer, sort mail, recycle and deliver medications to patients. Being at the Hospice office and doing my normal tasks, helps Hospice employees, and that’s very fulfilling. I consider them angels for the work they do! My favorite foods are Italian, Mexican and Chinese. I especially love pizza!